Spring is a great time of year. In fact, if you are like many other people, it just may be your favorite time of year. The cold of the winter has gone, the flowers are blooming, and the heat of the summer has not yet arrived. There is plenty to like about those spring months, but spending extra money is one thing that you should not see as a positive. Unfortunately, many people spend extra money in the spring for a variety of reasons. This leads to busted budgets in March, April, and May. So, why do people spend more in the spring, and how can you avoid making similar mistakes? Here are 5 common reasons people spend more in Spring, and how you can avoid them! If you live somewhere that typically experiences rather cold winters, you are probably excited at the prospect of being able to get outside for a chance once spring arrives. However, many of those outdoor activities that you enjoy are going to take a toll on your finances. Something like playing golf certainly will sound nice after a long winter, but those greens fees are going to add up in a hurry. To steer clear of this issue, try looking for free outdoor activities like hiking or playing tennis at a local park. 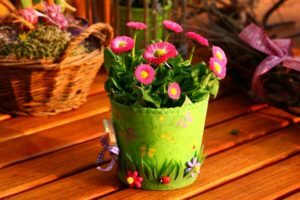 For those with a green thumb, spring is the perfect time to get outside and plant some flowers. Of course, those flowers aren’t free, and neither are the rest of the supplies you need to landscape properly. So how do you get around this issue while still caring for your property? Look for low-cost landscaping alternatives. Putting in a large lawn that covers much of your available space is a cheap way to beautify your grounds, since that lawn won’t need to be replaced each year. While humans don’t hibernate like some animals, we do tend to stay in more during the cold winter season. That can lead to an accumulation of projects and other items that need to be taken care of when we ‘come back to life’ in the spring. Things like basic maintenance around the house or service for your car might fall behind in the winter, leading to a rash of expenses in the spring. Try to keep up with everything during the winter months so you don’t have to handle all of these costs at one time. Spring is tax time. So, you might find yourself spending money if you need to pay off your taxes from the previous year. To avoid this problem, try to get ahead of the tax game. Save up during the year prior if you feel like you are going to owe in April. There is nothing you can do about having to pay taxes. But, you can at least be better prepared for the cost. Everyone loves a good summer vacation, but these experiences can be expensive – and they will sometimes need to be paid for in advance. If you book a trip in the spring that requires a significant deposit, you could find that your budget is in rough shape during those spring months. Be realistic with your vacation plans and only plan trips that you are sure you can comfortably afford. Do you spend more in Spring? What areas of your budget do you tend to spend more on in Spring? I think most of us are just so excited about the nicer weather that we want to get out and enjoy it more. Even though there are a lot of low-cost and free options to enjoy the outdoors, we often wind up spending more money while doing it. Rather than go hang out in a park we might find ourselves wandering downtown, which leads to in-and-out of stores, and often leads to a (not inexpensive) meal before we head home. It can be a slippery slope for sure. At least that’s been a challenge for us. I have a separate savings account for travel to make sure that I am saving enough and I make it a priority. I agree it should be realistic as I want it to make that plan happen and wouldn’t just pass it to other times.